Pretty Bowtiful was born out of frustration after not being able to find the perfect accessory to match my daughters outfits. 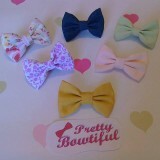 We make custom hair bows lovingly crafted from quality fabrics. I’m always happy to order fabrics so if you don’t see what you like then let me know!